Type /epgp in the chat window to open the addon. The addon does not currently help with the loot bidding process. It is just for managing the EPGP totals. The addon maintains a single score for all characters (aka alts) belonging to a single person's account. Stop Timer - stops the scheduled EP addition. This button only shows if the Start Timer button was pressed. Selecting a row in the grid will auto populate the fields below. This is the easiest way to use the addon. Just assign the character the loot via master looter and then press the Add Loot button on the main addon screen. Your newly assigned look should be 1st row on the grid, so click on it and press the OK button. Selecting a row where the account name is blank will still auto populate the screen, but the account receiving the loot will default to the person selected on the main screen when you pressed the Add Loot button. You can also auto populate the screen by linking an item. Just shift-rightclick on the item when the Add GP screen is showing and the fields will be auto populated. 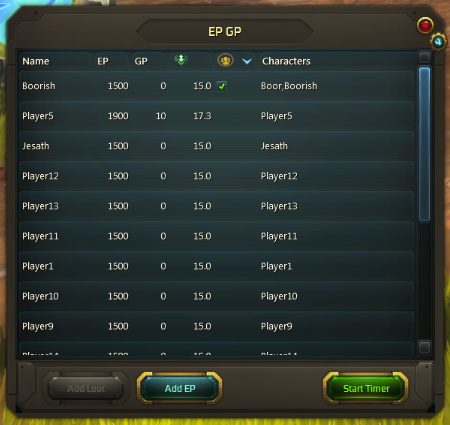 The account receiving the loot will be the person selected on the main grid when Add Loot was pressed. Main Spec / Off Spec - these toggle buttons are never auto populated. This is an extension to EPGP used by my guild where we allow people winning loot when playing in an off spec capacity to get loot at a quarter of the normal cost. For example you are full on tanks for a raid, so a player joins on his tank character as a dps. This off spec player will only be given a chance to loot if all the main spec player pass on an item. If the off spec player wins an item just populate the screen as normal but them press the Off Spec toggle. This will quarter the GP cost of the item won. The green frame at the bottom of the screen will give a textual description of the loot item plus its calculated cost. The Basic Mode check box at the top of the screen allows you to just enter the GP you have decided yourself. Based on an original Delphi application written by Kad.